Harvard Law School Visiting Professor and co-director of the Berkman Center Susan Crawford joins Mayor Joseph A. Curtatone, Mayor of Somerville, MA, Jascha Franklin-Hodge, Chief Information Officer for the City of Boston and Harvard Business School Professor and Chief of Staff to Mayor Menino, Mitchell Weiss, for a lively discussion around her new book, The Responsive City. The talk will be moderated by Harvard Law School Professor and co-founder and Director of the Berkman Center Jonathan Zittrain. Lunch will be served and the author will be available for book signing. 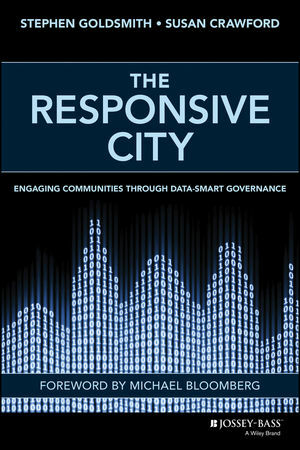 The Responsive City is a compelling guide to civic engagement and governance in the digital age that will help municipal leaders link important breakthroughs in technology and data analytics with age-old lessons of small-group community input to create more agile, competitive and economically resilient cities. The book is co-authored by Professor Stephen Goldsmith, director of Data-Smart City Solutions at Harvard Kennedy School, and Professor Susan Crawford, co-director of Harvard's Berkman Center for Internet and Society. Susan Crawford is a professor at the Benjamin N. Cardozo School of Law, a fellow at the Roosevelt Institute, and a co-director of the Berkman Center. She is the author of Captive Audience: The Telecom Industry and Monopoly Power in the New Gilded Age, and a contributor to Bloomberg View and Wired. She served as Special Assistant to the President for Science, Technology, and Innovation Policy (2009) and co-led the FCC transition team between the Bush and Obama administrations. She is a member of Mayor Michael Bloomberg’s Advisory Council on Technology and Innovation. Ms. Crawford was formerly a (Visiting) Stanton Professor of the First Amendment at Harvard’s Kennedy School, a Visiting Professor at Harvard Law School, and a Professor at the University of Michigan Law School (2008-2010). As an academic, she teaches Internet law and communications law. In December of 2012, Yale University Press published her book, Captive Audience: Telecom Monopolies in the New Gilded Age. She was a member of the board of directors of ICANN from 2005-2008 and is the founder of OneWebDay, a global Earth Day for the internet that takes place each Sept. 22. One of Fast Company’s Most Influential Women in Technology (2009); IP3 Awardee (2010); one of Prospect Magazine’s Top Ten Brains of the Digital Future (2011) and TIME Magazine’s Tech 40: The Most Influential Minds in Tech (2013). She is a member of the board of the Telecommunications Policy Research Conference (TPRC). Ms. Crawford received her B.A. and J.D. from Yale University. She served as a clerk for Judge Raymond J. Dearie of the U.S. District Court for the Eastern District of New York, and was a partner at Wilmer, Cutler & Pickering (now WilmerHale) (Washington, D.C.) until the end of 2002, when she left that firm to enter the legal academy. Susan, a violist, lives in New York City.